Resistance takes many forms. Sometimes it is violent. Sometimes it proceeds non-violently. Oppression and the imposition of a new culture are often executed by means of harsh and stringent measures. One way of life is brushed aside and forced to give place to another. The loss of cherished symbols of one’s identity and accompanying practices confronts the oppressed with a critical challenge: do I go along to get along, or do I take a stand? If the latter, how do I go about it? What form will my resistance take? What form should it take? Daniel is a book about resistance. It was written to people under pressure. In the book, we will see the efforts oppressive regimes take to undermine the faith and identity of God’s people. In it, we will also see the strategies God’s people employed in resisting the imposition of a foreign culture, and we will see what sustained their efforts. In that vein, the book of Daniel is powerfully relevant. Bill Ireland is pastor of First Baptist Church, Dalton, Georgia. A graduate of Mississippi College and Southern Seminary, he has also pursued additional study at Indiana University, Princeton University, and Oxford. He previously served churches in Mississippi, Kentucky, Louisiana, Georgia, and North Carolina before moving to Dalton. Bill is married to Ginny Bridges Ireland, and they have one daughter, Mary Virginia, who is a student at Mercer University. For fun, he enjoys boating, reading, and movies. 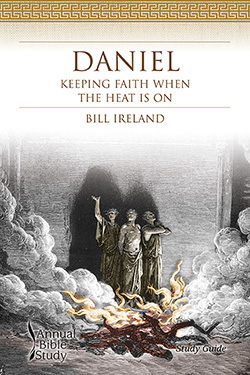 The Study Guide helps learners understand the biblical background of Daniel, how to interpret it, and its basic theological themes. Each session features thoughtful questions for reflection and discussion.